I typed a couple of paragraphs on a discussion board, but when I clicked the submit button, the site was undergoing (un)scheduled maintenance, and the back button decided to refresh the page, sending my paragraphs into oblivion. A quick web search revealed that Lazarus provides form recovery for Firefox. However, installing a plugin requires restarting Firefox, and even after restarting Firefox (which I haven't done yet), Lazarus can't recover forms it hasn't backed up yet. Now that the horse is out of the barn, I want to do the impossible: restore some or all of the text I typed, without restarting my browser. Edit: I should clarify. Lazarus is a wonderful solution for preventing future form data loss. This question is for people who have already navigated away from their form and lost its contents, but hope there is some way to salvage the situation. My solution was to get a core dump of the process and grep through it, but there might be a layman's way to do it (for example, somehow get Firefox to load the cached version of the previous page). Thus, solutions that only solve the problem in the future, without addressing the present, are off-topic in this question. Do not restart your browser or press the back button! This solution is hit or miss, and works on Linux. In short: dump the memory of the Firefox process, and search through it for fragments of your text. It's ugly, but it's your last resort. Note that a core dump may take several hundred megabytes of disk space. If it succeeded, you can now breathe a sigh of relief. 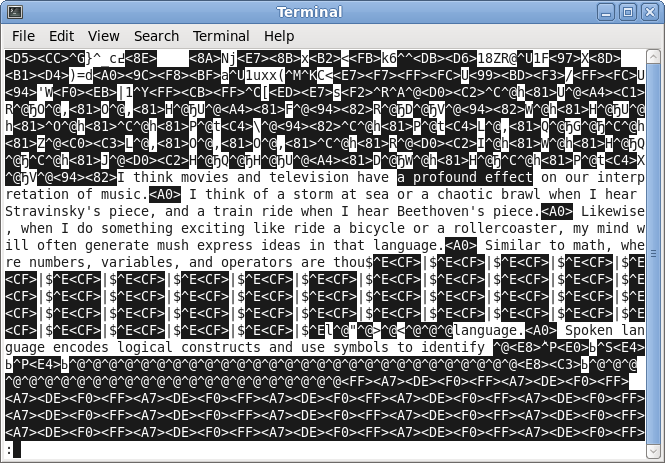 If your text was lingering in memory by chance, it has been captured in the core dump. my mind will often generate mush express ideas in that language. I imagine it gets clobbered like this because the memory holding your essay fragments is no longer allocated and gets trampled by subsequent allocations. The procedure is the same. 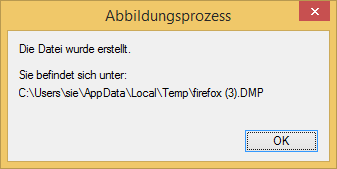 First, create a core dump of Firefox. This can be accomplished in the Task Manager. In English, the menu entry is Create Dump File. Dumping takes a few seconds. 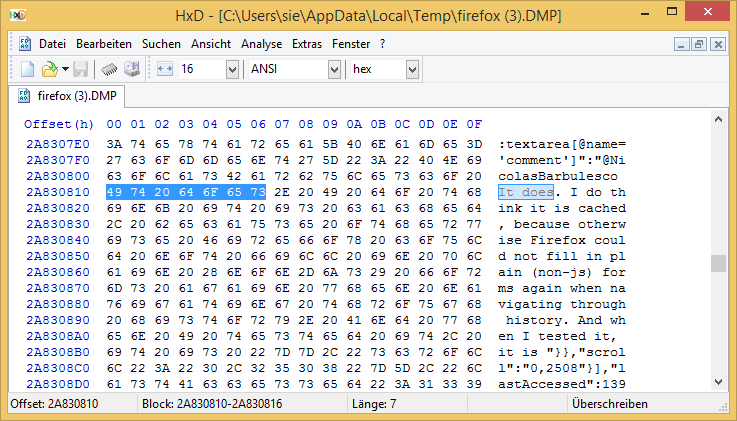 Then, use a hex editor like http://mh-nexus.de/en/hxd/ to open the dump, and search for the lost text. First thing -- forms are usually not cached. So, whatever you submitted is gone to the site and if it dropped it you are done; you need to re-type it. Lazarus uses a SQLite DB to store your form data (of course, only after it is installed). ps: the core-dump is a cute attempt to do the needful, however I wonder if there is a cost-to-effort benefit on that (this would be more useful as a spyware/malware technique -- no offense to Joey here). Not the answer you're looking for? Browse other questions tagged linux firefox or ask your own question. Does Firefox cache submitted form content anywhere I can recover? Configure Firefox to remember form changes when accidentally leaving a HTTPS page? How can I make Firefox automatically fill a username/password form and submit it? How do I make firefox work with a macro?